Getting a parcel in the post is a surefire way to put a smile on my face. It’s great when its a present from me to me (cookbook, obviously), fabulous when from a friend or relative, but nothing can top the feeling of getting a parcel full of unfamiliar foodie goodies from a complete and utter stranger. Especially when it’s sent by someone who went above and beyond the call of duty and delivered unto me an amazing Foodie Penpal Parcel. Christine (or @Dashinista on Twitter) did a fantastic job and really hit the nail on the head from the guidelines I gave her. First up were some great spice mixes: You Must Be Jerking, Magnifico Meatballs and A Toast Sensation, from the online shop The Spicery. The jerk seasoning was delicious with a real depth of flavour, and I can’t wait to try the other mixes, especially as I love meatballs and am always looking for new ways of flavouring them. There was also a sample packet of ground star anise which I’m very much hoping to use in a cake once I get hold of an oven ( less than two weeks to go!). Having never heard of The Spicery before, I now have a feeling I’ll be a regular customer of theirs. I also got a balsamic and oil salad dressing which will come in very handy to dress salads while I’m trying to lose weight, some chocolate coated rice cakes (strangely addictive, must be the chocolate!) for healthy snacking, some white chocolate and raspberry chocolate bites (really tasty and from a Turkish coffee shop near to Christine) and some jasmine tea pearls from Teapigs. I was really looking forward to drinking this tea despite the fact I betray my country by not enjoying tea at all (England I can only apologise) as it smelt so good when stewing in hot water. I guess my tastebuds just don’t fully get tea, as to me it tasted bland but to The Boyfriend it tasted like sherbet. I can’t tell you how gutted I was that I was missing on what he described as healthy liquid sugar, but I guess me and tea just don’t get each other, no matter what shape, form or flavour. Christine also included a voucher for Graze which I’ve now cashed in and received a little box of snacks at work – another lovely little present in the post – and 4 weight watchers recipes that she regularly uses. 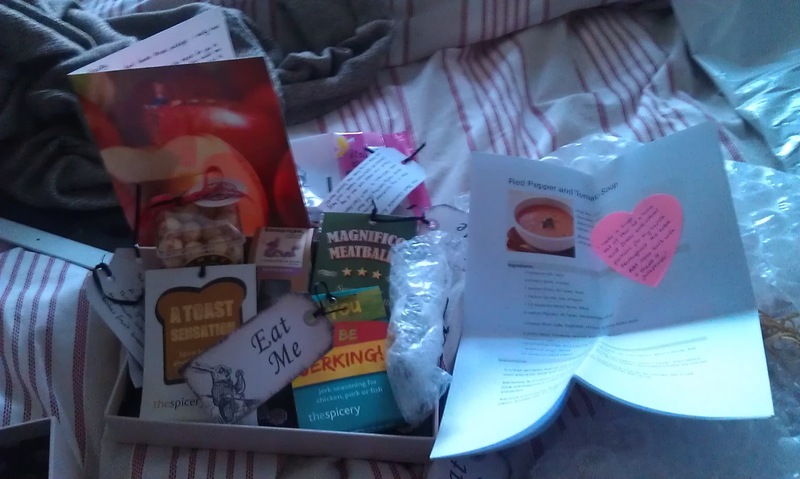 Combine all this thoughtfulness with ribbons, heart shaped post its, gorgeous ‘eat me’ labels and a pink box and you have Foodie Penpal utopia. Being so overjoyed at this parcel upon receiving it has insured me to up my game on sending out parcels so I can spread the joy. Christine – thank you, a delicious and inspiring parcel that I’m fairly certain I’ll never be able to match, but it will certainly be a lot of fun trying!